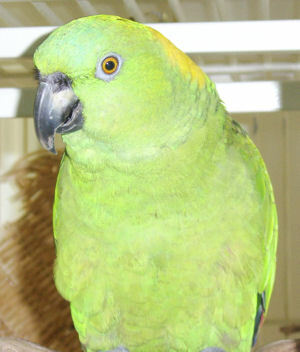 Omar is a Yellow Naped Amazon is approximately 38 years old and has been in our home for 20 months. Omar arrived at our home with a house guest and when the house guest left Omar stayed. He was in poor condition, especially his feet. His feet had been frostbitten, however after a few trips to Pet Emergency Treatment and Dr. Frederickson from Alaska Pet Care, he is now in good medical condition. He only has two toe nails, which is OK, as it cuts down on the time we spend on nail trims. When Omar first arrived we were unable to handle him and he was on diet of seed from Wal-Mart and peanut butter cookies. When Omar arrived we did not know anything about birds except that they bite and it hurts! We then had an accidental meeting with a bird person, Lin Westgard. I explained that we had a green bird in our house and for toys he had a rock and a coffee can hanging by wire. She kindly took us under her wing and now we are officially bird nerds. Omar had never been socialized and we were unable to handle him at first. Until one day, Omar was standing on his exercise perch, Eric walked by and Omar put his foot up and stepped up on Eric�s arm. Eric promptly replied �I have a bird on my arm, now what?� So, who is Omar�s Daddy? Definitely Eric; he and Omar are now best friends. Omar now says �Omar loves Daddy!� Omar is still learning to tolerate his Mom and sometimes does say �not her� but I love him all the same. Omar now has lots of toys, not rocks, a new cage and really enjoys spending time on his exercise perch. He now climbs all over his cage as his feet no longer hurt and talks constantly. He is absolutely thriving in his new environment and we are very happy to be a part of his flock.